The margins of victory in soccer, hockey and baseball are so small that creating a point spread for every game would be impossible. Before Charles K. McNeil invented the point spread in the 1940s, bettors relied only on the money line. Even though the money line still exists today and is widely available for football and basketball wagers, it is often overlooked. Unlike point spreads or over/under bets, points mean nothing. When players bet on the money line, they bet on one side to simply win, the final result is all that matters. Here, the Braves are the favorites, as the – (minus) in front of the 130 indicates, while the Marlins are the underdogs, as evidenced by the + (plus) in front of the 120. This means that those who want to bet on the favorite, the Braves, will have to risk $130 to win $100, while those who want to wager on the underdog, the Marlins, need to risk $100 to win $120. Keep in mind that although money lines are expressed in units of $100, you don’t have to bet that much money, a money line works as easily with a $5 or $10 bet as it does with a $100 wager. In this example, the player has to risk $220 to win $100 by betting on the Yankees and those who bet on the Royals would risk $100 to win $190. Money lines in football are the favorite choice of those players who have been burned by last-second scoring that had no effect on the outcome of the game. With a money line, they just need their team to win; they don’t have to worry about them having to cover a point spread. However, they have to risk more money to return the same amount that a point spread would net them. outright is very risky. Betting on a football team at -3.5 and watching the losing opponents score a meaningless touchdown as time expires to cut the game to 24-21 is even more frustrating than having to deal with the math involved with betting money lines. In hockey, many games are decided by one run or one goal, which makes a point spread useless. Puck lines are available, but the line is always -1.5 or +1.5 and using money lines will impact the odds. Money lines are not placed on the favorite or the underdog when the point spread is over 25 points in football or around 20 points in basketball or when the lines are ½ a point to 1½ points. It’s easier to bet money lines on a head-to- head sport like tennis. The presence of big-name tennis stars allows seeing lines from -1000 to -5000, which means that a player has to wager more than $1,000 to win $100. This phenomenon occurs because just a few select players dominate the odds in tennis. Roger Federer and Rafael Nadal are heavy tennis betting favorites in every tournament they enter. When betting tennis money lines, keep in mind that each player reacts differently depending on what surface they’re on: grass, hard courts or clay. Also keep track of injuries and fatigue. 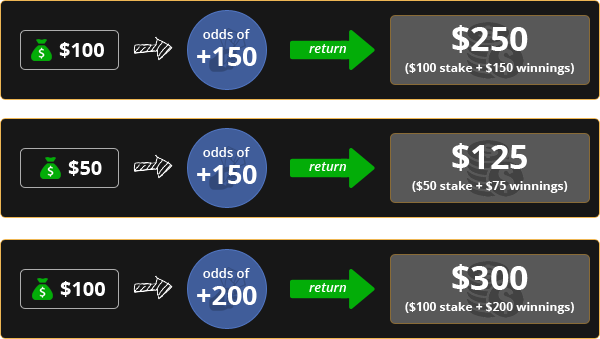 While point spreads can still be used, betting with money lines gives players a choice that can help them decide whether or not to make a wager.